Based on real-life events, Brooklyn insurance lawyer James Donovan (Hanks) finds himself thrust into the middle of escalating Cold War tensions between Russia and the United States. First he is tasked with defending Rudolf Abel (Mark Rylance), a Soviet spy caught plying his trade on U.S. soil. Donovan, out of his depths, takes the job to heart, which no one really wants him to do—the government wants to make a show of Abel having justice, while the spy is resigned to his fate and largely indifferent. This, of course, makes Donovan and his family reviled. When a U.S. U-2 spy plane is shot down, and the pilot, Francis Gary Powers (Austin Stowell), is captured, Donovan is tapped to negotiate an exchange of agents by East and West and must venture into the heart of the Eastern Bloc to make it happen. This has all of the elements to be a fantastically taut drama with huge global stakes, and the Coens try to infuse the formula with new life. 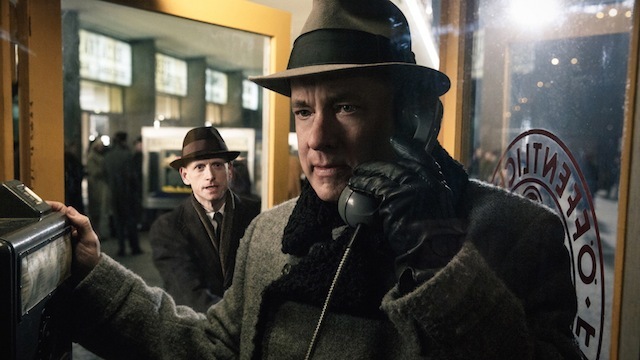 Unfortunately, as a finished product, Bridge of Spies feels like two very different things—a Steven Spielberg movie and a Coen Brothers script, and the two sides never adequately reconcile. The Coens write whip-cracking banter in damn near any situation, that’s one of the things that set their films apart, and the script is full of this type of conversation, where Donovan verbally backs his opponent into a corner until all they can do is stammer or lash out. They’re also very good at directing this sort of verbal pace, but with Spielberg at the helm, it comes off as clumsy and unwieldy. The result is not unlike an uncomfortable dinner conversation with a socially awkward friend of a friend who always says the wrong thing. You can’t help but think that, in the Coens’ hands, they could have pulled it off, but in Spielberg’s it’s clunky. The overriding seriousness of the situation—with legitimate potential for worldwide catastrophe, nuclear war, and the annihilation of all life on the planet, the stakes couldn’t be higher—is undercut by the ill-placed, ill-timed sense of humor. It’s easy to understand the impulse to lighten the mood, but as executed, it plays like a mismatch, undermines the gravity of the situation, and hamstrings any hope of tension in what is inherently as tense a situation as you can imagine. Hanks is charming and affable, and it’s damn near impossible not to find him endearing, but while he does what he can with the material—the Coens’ words are handled best in his mouth—his character is also super one note. 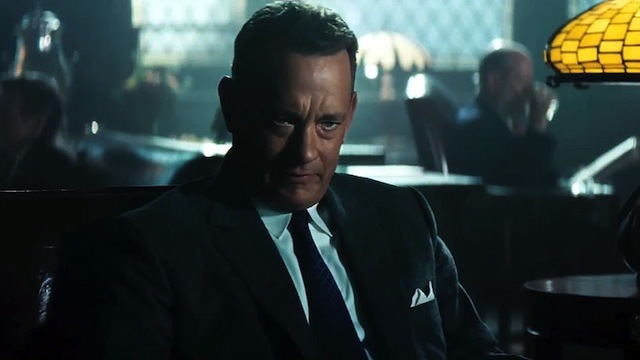 Donovan is a completely flat line throughout Bridge of Spies. He does what he does because it’s the right thing to do, and it is never more complicated than that. Spielberg and the script want to set him up as a lone man, bravely standing up against unimaginable odds, the face of sanity in an insane world. That’s all well and good, great movies have been made about this since day one of cinema. Donovan is almost killed, imprisoned by various Communist regimes, and gets his family shot at in their own home, but he never once, not ever, wavers for even a second. Instead of playing as heroic and courageous and noble, however, he comes across as stubborn, bullheaded, and even a little naïve. Donovan tries to negotiate the pilot’s freedom, and you’re supposed to care, but that character is nothing—if they had simply named him “Pilot,” he would carry the identical emotional weight. The same goes for an American student incarcerated by the East Germans. They’re completely empty spaces, nothing more than items the protagonist is trying to acquire; they could be anyone or anything. That’s all their supposed to be—no one cares about the kid except Donovan, that’s the point—but instead of illustrating his drive and desire, it plays as tedious filler. The rest of the cast, unfortunately, is horribly underused, or just not used at all. Because this is a Steven Spielberg movie, there is a cadre of fantastic actors, but no one has anything to do. Jesse Plemons gets a handful of throwaway lines; Amy Ryan is relegated to playing a stock worried wife fretting at home while her husband is out doing things; Alan Alda is completely wasted as Donovan’s boss at the law firm, asked to do nothing more than play a scheming lawyer; and Domenick Lombardozzi is a bonehead cop in one scene (okay, maybe that one isn't too bad). Visually, Spielberg is as on point as ever. He makes every shot, every angle seem so natural and effortless that he doesn’t often get the credit he deserves—at this stage, greatness is just expected. He places you right there with his characters, doesn’t cut until necessary, and this creates an intimacy to his scenes.